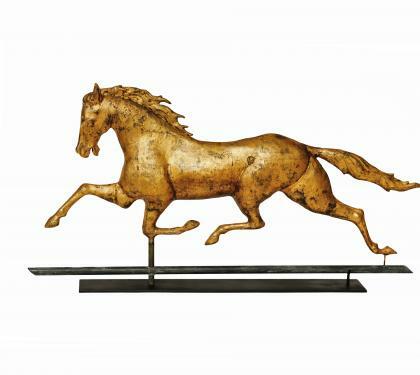 The Patchen Horse Weathervane is an iconic representation of the famous racehorse "George M. Patchen" cast in copper. The striking image of a racehorse leaping through the air is one of grace and agility. The weathervane has been gold gilded in the 20th century and rests on an iron base. Good condition with gold gilding in the 20th century. Dimensions: Height 21" | Length 39.5"